I don’t know about you, but I am a HUGE fan of big comfy chairs for reading, snoozing, lounging or chatting with my family and friends. Poor Wayne-Face used to dread going out driving with me because if I saw an old armchair on the side of the road begging to be rescued, he knew he’d have to wrestle it into the car somehow so that I could bring it home and reinvent it with paint, a colorful blankie or some other arty fartsy sorcery. This little beauty was actually three bucks at our local Habitat for Humanity resale store – what a DEAL! Here she is covered with a beautifully crafted quilt that I scored at a flea market in Asheville a few years ago for (wait for it) $10! The lady was glad the quilt was going home with someone who was dancing around her stall like a demented pixie screeching “Mine! Mine” at passers-by. Here’s another comfy arm chair charmer that I couldn’t wait to get my painty little mits on. Yes, we did grab this old girl from the side of the road (designer road-kill, I call it). Wayne-Face was reluctant, but sweet enough to indulge his crazy wife. 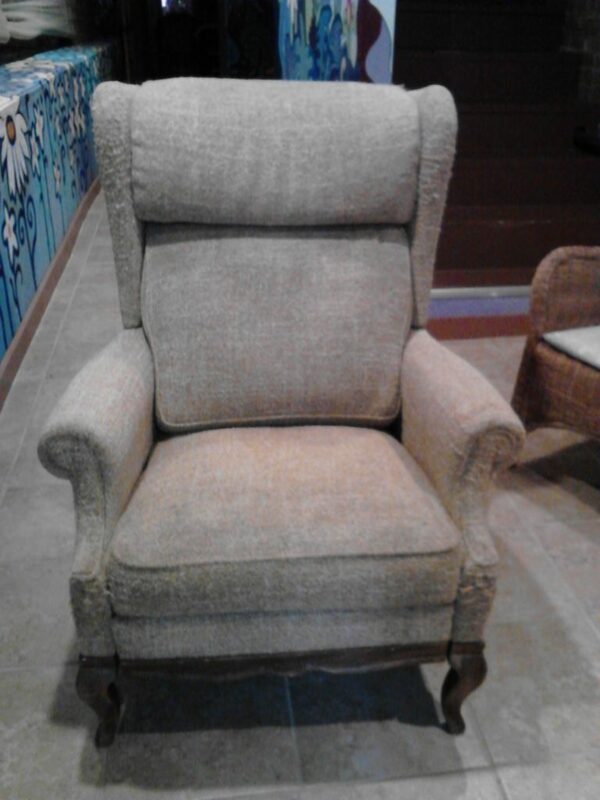 After I gave it a THOROUGH cleaning, I snagged some awesome yellowish-greenish paint and gave this vintage Lazy-Boy a good once-over. Wayne-Face was skeptical, but I had a VISION! Ta-da – here she is when she was in my former office. And now that she is at home, GUESS who sits in her the most? Yes, she has become “daddy’s comfy armchair”. Hmmmm. 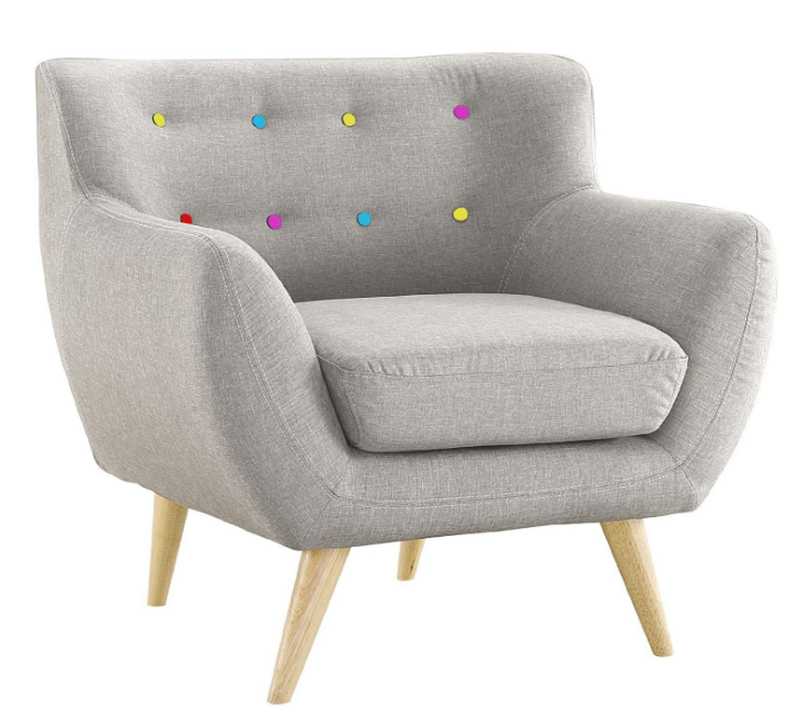 This super-stylish mid century grey armchair with red, yellow, fuchsia and blue buttons (yum!) is made by Divano Roma Furniture and available on Amazon. I think the price is pretty reasonable at around $150. What I love about this chair are the natural wood legs, the simple grey linen upholstery and of course, the COLORFUL BUTTONS (doing the vibrant colors dance here). 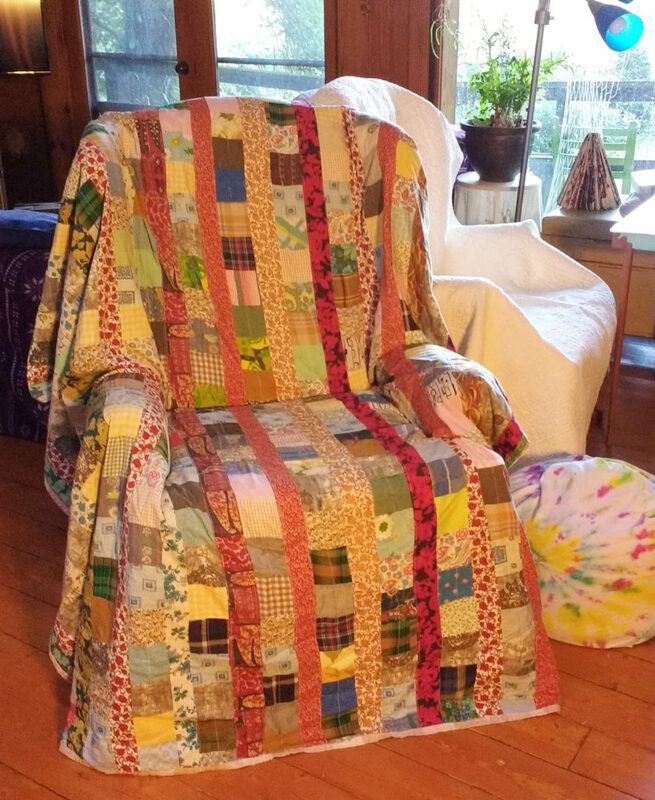 The next colorful creation is this delightful patchwork fabric rocker arm chair – I could have these beauties draped around my house all day long. It’s the patchwork – it does things to me! What I especially love about this patchwork armchair is that it is not overly snooty-looking. It’s casual but stylish, funky but comfy. This one gets two thumbs up from the #VibrantCrafter for style and deliciousness. The stainless steel on the legs and the natural wood rockers reminds me of one of those cool old pre-war bi-planes. 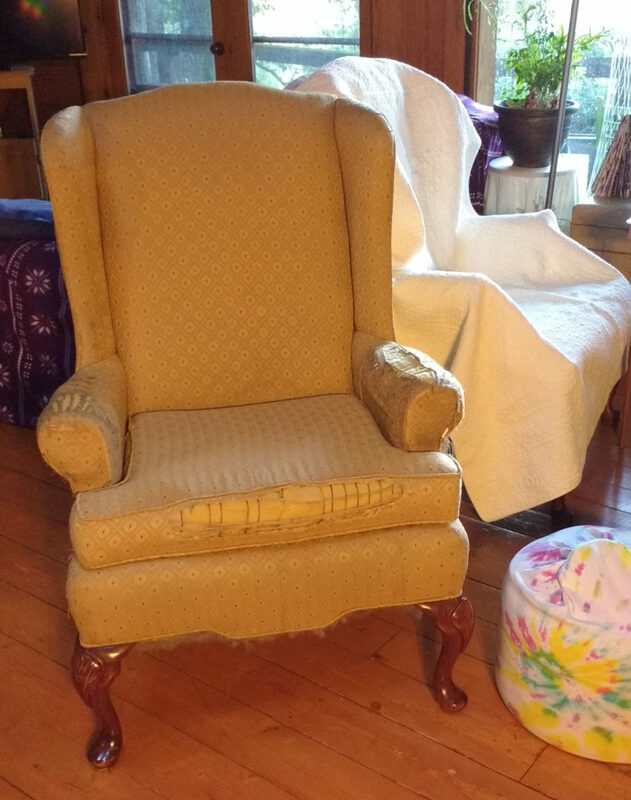 Not only that, but imagine this sweet rocker in your baby’s nursery – can you see it? 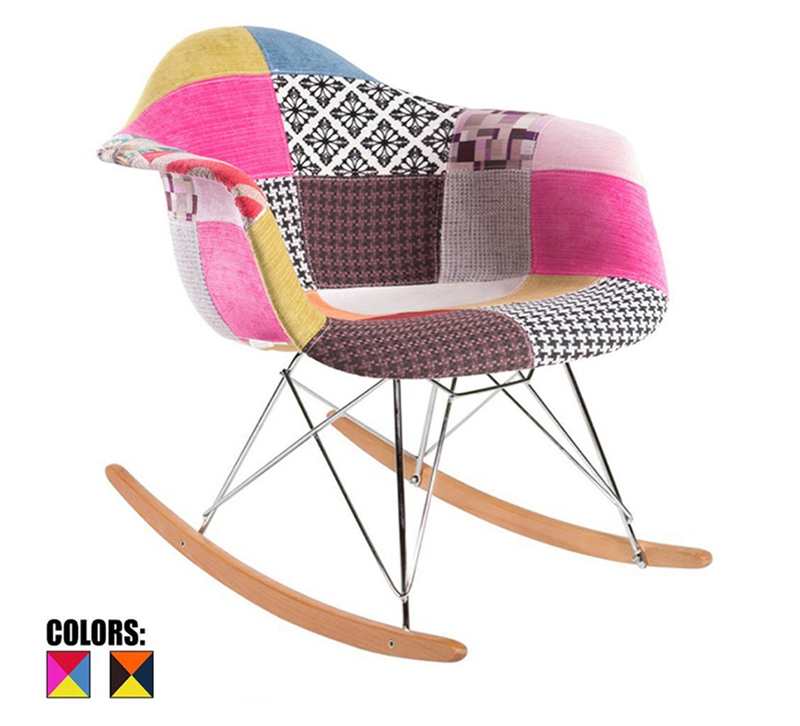 Amazon sells this rocking armchair in several different colors – woohoo! This one is even more reasonably priced at a little over a hundred bucks – a steal considering how green your sister-in-law’s eyes will be when she sees it! 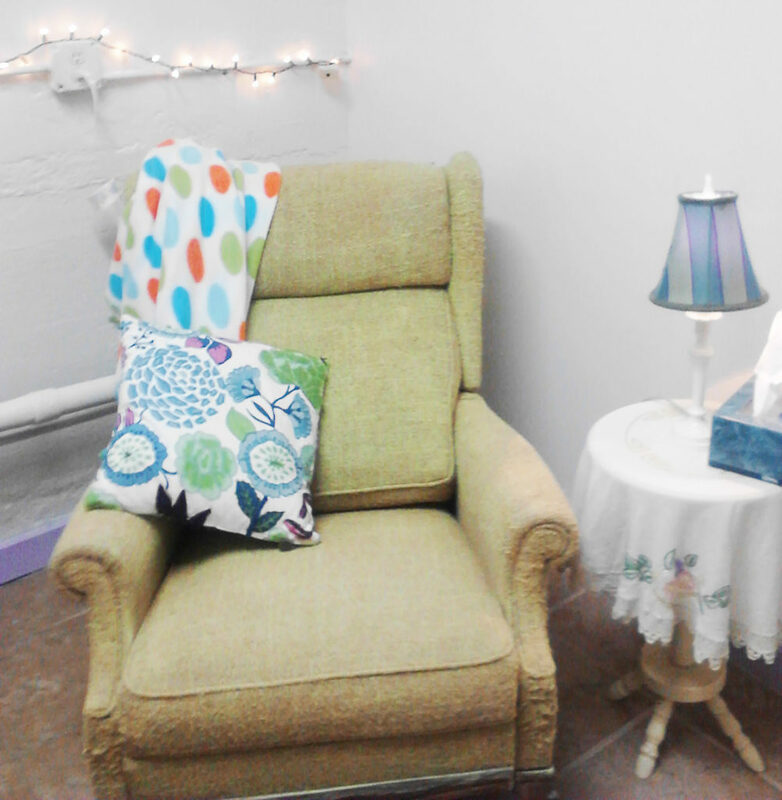 Stay tuned for more opinionated blogs about chairs – my favorite piece of furniture in the world! P.S. If you’r wondering why Wayne no longer dreads driving around with me, it’s simple – there’s no more room for chairs in our house. But hey – there’s plenty of comfy chairs to sit in!